SAN JOSE, Calif., Nov. 14, 2018 /PRNewswire/ -- Today, Cabot Corporation (NYSE: CBT) announced that it has reached an agreement to have SunPower (NASDAQ:SPWR) install a 1.12-megawatt solar project paired with a 470-kilowatt (940-kilowatt hour) integrated energy storage system at Cabot's Business and Technology Center in Billerica, Massachusetts. 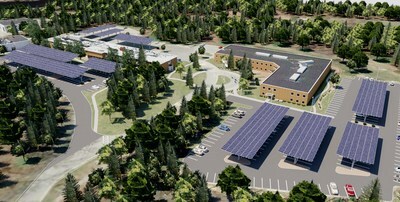 This commitment is a first for Cabot and will contribute to its long-term sustainability efforts by helping to advance solar development in the state and meet Massachusetts' renewable energy commitments. This press release contains "forward-looking statements" within the meaning of the Private Securities Litigation Reform Act of 1995, including, but not limited to, statements regarding project plans and timelines, projected energy output, and cost savings. These forward-looking statements are based on our current assumptions, expectations, and beliefs and involve substantial risks and uncertainties that may cause results, performance, or achievement to materially differ from those expressed or implied by these forward-looking statements. Factors that could cause or contribute to such differences include, but are not limited to: regulatory changes and the availability of economic incentives promoting use of solar energy, challenges inherent in constructing and maintaining certain of our large projects, and fluctuations or declines in the performance of our solar panels and other products and solutions. A detailed discussion of these factors and other risks that affect our business is included in filings we make with the Securities and Exchange Commission (SEC) from time to time, including our most recent reports on Form 10-K and Form 10-Q, particularly under the heading "Risk Factors." Copies of these filings are available online from the SEC or on the SEC Filings section of our Investor Relations website at investors.sunpowercorp.com. All forward-looking statements in this press release are based on information currently available to us, and we assume no obligation to update these forward-looking statements in light of new information or future events. © 2018 SunPower Corporation. All Rights Reserved. SUNPOWER, the SUNPOWER logo and HELIX are registered trademarks of SunPower Corporation in the U.S. and other countries as well. All other logos and trademarks are properties of their respective owners.